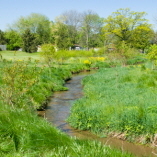 High’s Greenfield Corporate Center is the first property of its kind in Lancaster County, Pa., that is home to a riparian buffer. High Concrete Group has introduced three new products that reduce the environmental impact of the built environment by consuming less energy. Each year, approximately 92 percent of mill products sourced by High Steel Structures consists of recycled materials. High Construction helped Lancaster Mennonite School create an academic facility with ample sustainable features and earned a General Contractor Sustainable Design Award.